CALIFORNIA GIRLS STATE PROGRAM AND ITS ALUMNAE. Copyright © 2016. The American Legion Auxiliary Girls State Alumnae Foundation. All rights reserved. GIRLS STATE® is a registered trademark of The American Legion. The American Legion Auxiliary Girls State Alumnae Foundation is a 501(c)(3) charitable organization, Federal Tax ID: 20-3187027. Connect with your American Legion Auxiliary California Girls State network at the social media and communication outlets listed above, and at Snapchat at "CAGirlsState." Shop at the ALA GSAF online store here. View the American Legion Auxiliary California Girls State website here. 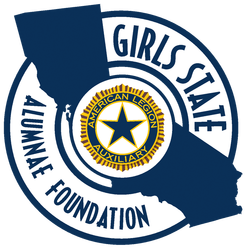 ALA Girls State Alumnae Foundation is a 501(c)(3) charitable organization, Federal Tax ID: 20-3187027.